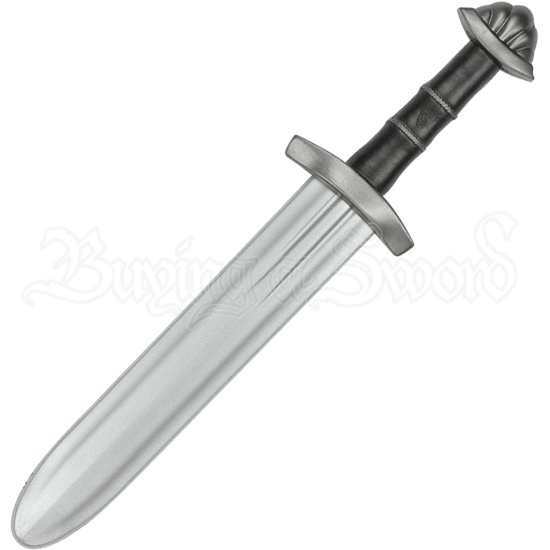 The Viking II LARP Dagger takes its inspiration from the blades of ancient Norsemen and shieldmaidens. Its pommel shows off a traditional lobed shape. Latex-free Calimacil foam around a flexible fiberglass core makes this blade safe and durable for LARP battle. This Viking LARP dagger is perfect for close combat LARP encounters. It has a short blade in a steel color with a short double fuller. The guard is not much wider than the blade and curves slightly blade-ward. The grip has a leather look with two braided steel color bands surrounding a rune at the center. Whether your LARP character hails from the time of Vikings or a fantasy realm, this historical LARP dagger is safe, durable, and detailed, making it a great choice for all kinds of melee LARP combat.